The Virgin Atlantic World Elite MasterCard currently has an Informr score of 7.6 out of 10. This score is based on our evaluation of 6 sources including reviews from users and the web's most trusted critics. 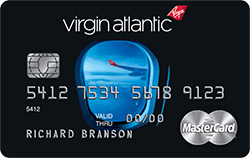 Virgin Atlantic World Elite MasterCard is typically available to those with good credit scores (650 or greater). Thanks to its high rewards rate, frequent flyers of British Airways can earn a pretty good return on their spending with the Virgin Atlantic World Elite MasterCard, though more mainstream travelers may find it difficult to redeem their rewards. The $90 p.a. annual fee for the Virgin Atlantic World Elite Mastercard could be well worth it if you frequently fly with Virgin Atlantic and its partners or even travel at all. It offers multiple rewards for your spending, including bigger returns for travel purchases. For high spenders, this card offers an expensive redemption but it also provides a lot of opportunity to earn award miles. If you don’t mind paying high fees when redeeming award travel, and if Virgin Atlantic offers award flights to destinations you’d like to visit, the Virgin Atlantic World Elite MasterCard® Credit Card can be a good deal. Get 20,000 Flying Club bonus miles after your first purchase. Earn 15,000 Flying Club bonus miles every anniversary after qualifying purchases. If Virgin Atlantic is your preferred airline, you value elite status and your card expenditures will be at least $25,000 annually, you should consider the card. As Virgin Atlantic purchases receive 3 Flying Club miles per dollar, miles can accumulate quickly. The 20,000 -mile sign-up bonus jump starts your earnings and certainly offsets the $90 annual fee. If you consider everything, the Virgin Atlantic Black Credit card seems ideal for most, especially if you love to travel. The annual fee is low, compared to many of the other cards that offer similar sky miles programs.